Can’t resist the lure of the ocean? We hear that, water babies! And what better way to appeal to your aquatic side than by going scuba diving? 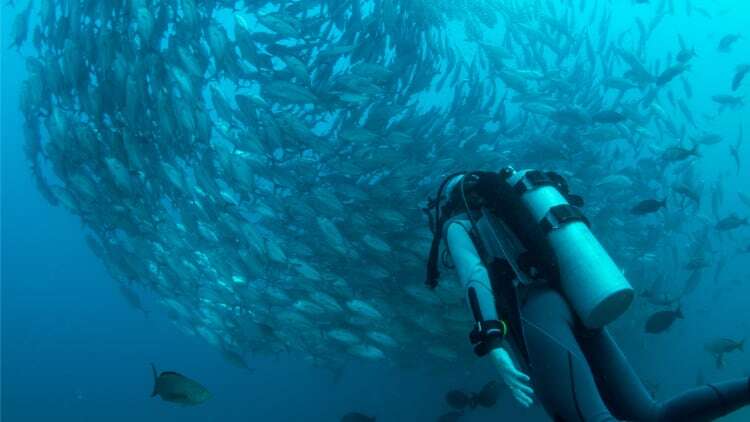 A fun, fascinating activity with many rewards, scuba diving gives you the chance to see the sea at its versatile best. From sunken shipwrecks to schools of fish that look like something straight out of a fantasy film, there’s plenty to marvel at beneath the surface. If you’re thinking of taking a scuba diving holiday, for the first time or the fiftieth, you really should ensure you're properly covered. It can be hard thinking about worst-case scenarios, but the fact is, being prepared is a smart move. Obtaining scuba diving travel insurance from Cover-More UK means you can experience the beautiful briny sea in an extremely exciting way, and with total confidence. Can I get cover for more than one scuba diving trip this year? Absolutely! After all, the sea is a big place – three-quarters of the earth’s surface, remember? You’ll need to do a lot of diving to explore all the underwater world has to offer. And that’s where our annual multi-trip insurance comes in. You’ll save yourself time and money – not to mention stress! – by taking out just one policy to cover multiple holidays. If you have this type of travel insurance, you can be abroad as much as you like within the year (up to a maximum of 120 days’ worth of travel). Not only that, but your policy benefits are also automatically topped up after you return from each trip, so you’re never left unprotected. Bear in mind though that there’s a limit to the duration of each journey you plan on taking; your options are 30, 45 or 60 days per trip. Sounds great! What else is covered? From our budget-friendly Economy Plan to our most comprehensive policy (the Diamond Plan), you can be confident in your level of cover. International travel insurance from Cover-More UK gives you overseas medical and dental coverage as well as 24/7 access to our emergency assistance professionals, so whether you need urgent medical care whilst you’re away or you’ve lost your passport, we’ll be on hand to help. Need to cancel your policy? Don’t worry; with travel insurance from Cover-More UK, you won’t lose out. Whatever your reason for cancelling, our 14-day cooling off period entitles you to a full refund (provided you’re not making any claims and neither your trip or policy has started). Where can I get a scuba diving travel insurance quote? And that’s it! You’re ready to go scuba diving with complete peace of mind, knowing that your holiday is well protected.